Tell me to name my favorite kind of pie and I will say “pumpkin pie!” without hesitation. Of course, I require a large dollop of whipped cream on top (must be whipped cream, no Cool Whip allowed) and an ice cold glass of milk nearby. But nonetheless, I love pumpkin pie, and I welcome the time of year when it’s everywhere. I’m pretty inflexible on my pumpkin pie accompaniments (the aforementioned whipped cream and milk), and am a stickler for a good crust, but even with all that, I managed to surprise myself by changing things up a little. I got out a spoon to sample the ice cream straight from the box. Verdict? Now that took me a little longer to think about. The flavor was good but… “interesting.” Interesting in the fact that it tasted just like the filling of a pumpkin pie, spices and all. I decided in order to be fully appreciated, it needed to be with some of those other accompaniments that complete pumpkin pie in my mind. Before I could continue my theoretical list of tasks, (I wasn’t intending to do any actual work—I was in the middle of hosting our dinner guests, after all!) Jan produced a pre-made Honey Maid Graham Cracker crust from our Mary-Poppins pantry, and directed me to a carton of whipped cream in the refrigerator. I let the ice cream sit out on the counter to get soft, scooped about half of it into the crust, covered it in plastic wrap and put it in the freezer. I then whipped the whipped cream with a sprinkling of powdered sugar, spread it on top of the slightly-chilled pie, and placed back into the freezer. A bit later in the evening, it was time for dessert, and to sample this great experiment. The results were surprisingly good! It was like a frozen, refreshing pumpkin pie! 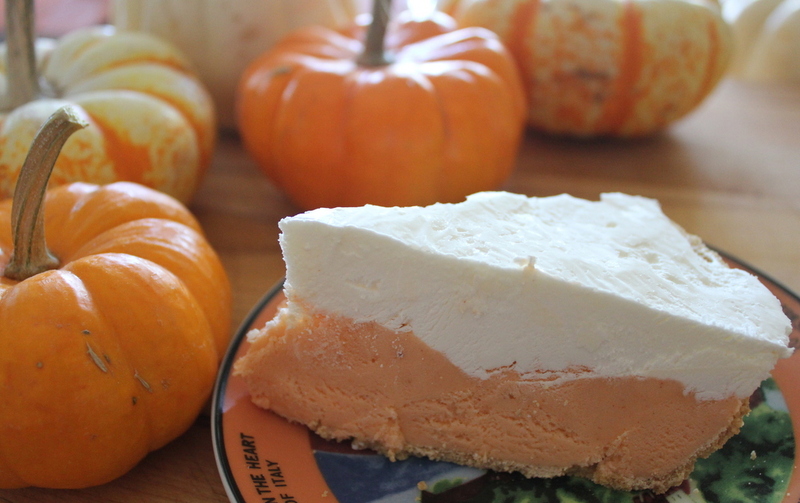 I’d never thought that pumpkin pie could be refreshing, but here it was! The new frozen pumpkin pie won’t be replacing my regular favorite, but it was added to the selection of holiday pies we served at our family Thanksgiving dinner we hosted on Friday (much easier for us all to get together when it’s not the actual day!) 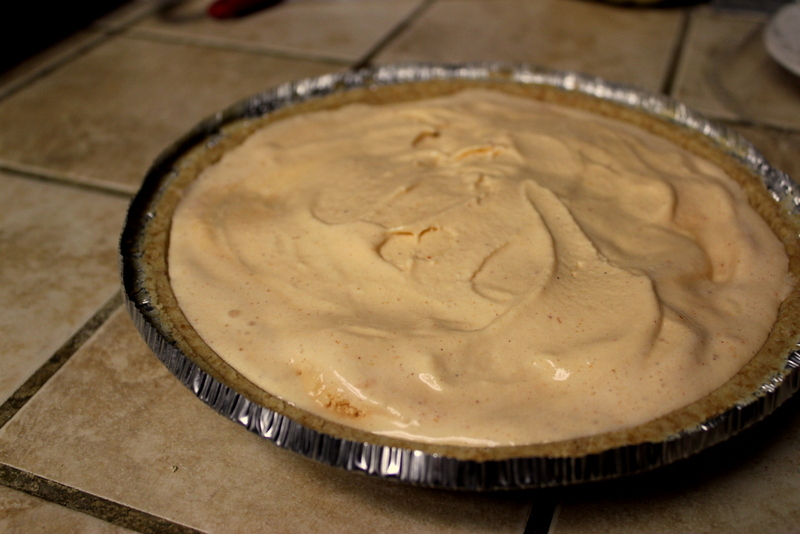 and this time, I let the guests put on their own whipped cream (instead of freezing it with the pie). 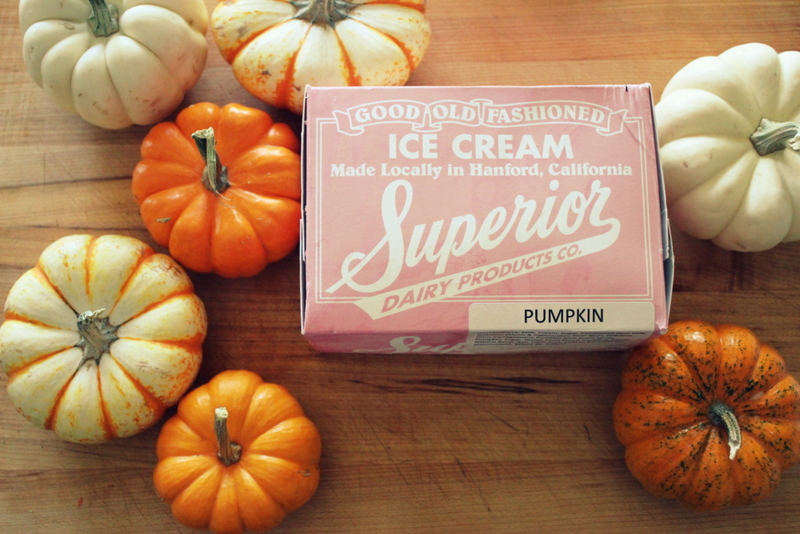 Frozen whipped cream or no, it’s the way to serve the pumpkin ice cream – with its friends! 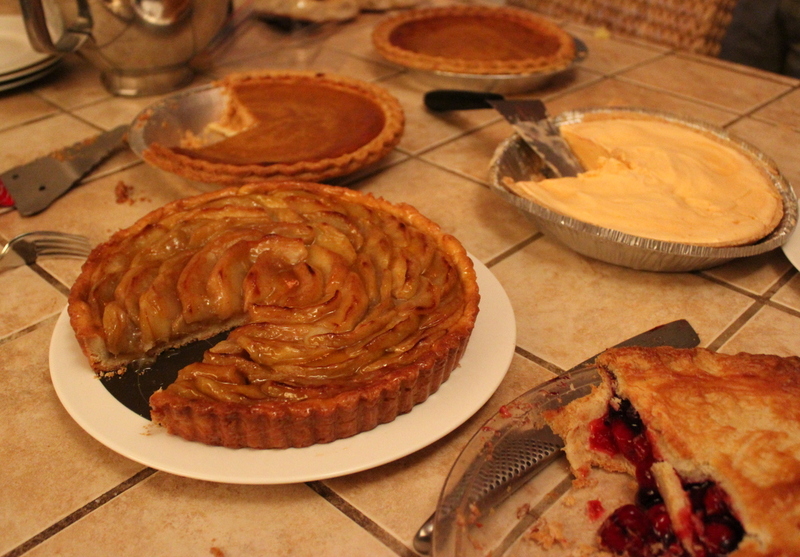 It was light and our guests also described it as “refreshing,” though that didn’t stop us from overdoing it on amazing homemade berry pie, homemade pumpkin pie, and homemade apple tart. Next Update. And Cottage Pie. I can attest to the sheer deliciousness of this culinary creation. Mad props go to Sim (for the ice cream) and to Jan’s intimate knowledge of the Mary Poppin’s cupboards/pantry. Also to Anna for being so creative on the fly! Most delicious.